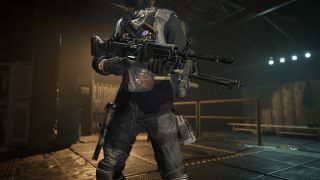 Pestilence is the Dark Zone exotic in The Division 2, and we'll explain how you get this light machine gun. The first update of The Division 2’s Invasion: Battle for DC gave us a whole bunch of things to play with. World Tier 5, gear sets, new invaded missions, a whole new Stronghold, and, of course, new exotics to collect. One of the new exotics is Pestilence, a light machine gun with some somewhat disappointing stats offset by very interesting talents. Not to mention it’s a pretty fun exotic to get, which is a nice change from the soul-crushing grinds of the Chatterbox, Merciless and Sweet Dreams. Pestilence is an Outcast-themed LMG. Its damage output is incredibly low compared to some high-end equipment, at a measly 4.1k, but the talents turn it into something that plays to the LMG’s strengths to become an excellent crowd control and close-quarters weapon. The first talent, and headliner, is Plague of the Outcasts. Triggered by landing 20 shots on the enemy (which explains the low damage output), Plague of the Outcasts will cause the enemy to leave behind a toxic cloud for 10 seconds when they are killed. Any other enemy caught in this cloud will receive the Pestilence debuff, and, while they are inside the cloud, will receive 200% weapon damage. The Pestilence debuff has two simple properties. The first is any healing they receive is halved for 10 seconds. The second has bigger ramifications for PvP: an enemy who would normally be downed will instead be instantly killed. This might not sound brilliant, but it could be very useful to prevent enemy players in Conflict making an unexpected comeback. However, it can be removed should an enemy use a kit to repair to full armour. The final talent is Outcast Resilience. When the Pestilence is holstered and you’re blinded, burning or bleeding, you’ll receive 20% bonus armour for five seconds. This won’t turn you into a tank by any means, but it’ll give you a small amount of breathing room should you be hit by an unsuspecting status effect. Hope you’re ready for some PvP, because Pestilence is the Dark Zone Exotic. Make sure you’ve read our Dark Zone guide in order to make grabbing your Pestilence as pain-free as possible. To get a hold of it, you’re going to have to head into any Dark Zone (some people say it only drops in the Occupied Dark Zone, however this isn’t true) and farm named bosses. Named bosses lurk around landmarks, so completing them is easily the quickest way. It’ll take a while, but eventually a boss will drop a contaminated Pestilence (and, weirdly, all of its mods as individual items, but don’t worry about that). Before you’re able to use it, you’re going to have to extract it, which is very, very risky because of the second way of getting a hold of one. The alternative way makes you an objectively bad person, but it’s the Dark Zone where that’s okay. Go Rogue, and kill other players or hijack extractions, and eventually you’ll steal somebody else’s hard-earned exotic. Other players are understandably on high alert and will do everything they can to stop you from swiping one, but with a bit of PvP experience it’s a much quicker way than grinding out bosses. To up your chances of successfully getting one (regardless of your method), it’s highly recommended you team up with other players, especially random strangers who don’t seem too hostile. It cuts down on the number of potential Rogues, or, if you’re going for the theft method, makes taking an innocent player’s extraction a lot easier too. To make the most of Pestilence, use it as a support tool for a much stronger primary weapon. Focus on enemies in enclosed areas, or ones in choke points, to get the biggest coverage of the Pestilence debuff as possible. Land the 20 hits, then swap out to your primary weapon to finish the job and enjoy that double damage in the resulting cloud. In PvP, your role with the Pestilence isn’t as a damage dealer – enemies will be taking cover and healing too quickly for you to pull off the entire process yourself. Land the hits, then let your team take out an enemy to trigger the cloud, preferably in whatever choke point they’re trying to push. Pestilence seems like it’s specially positioned to be most effective in the Conflict modes, although how good it can be even there is questionable. Its area-of-effect Plague of the Outcasts talent makes it perfect for the tighter areas of the Conflict map, while Pestilence’s instant kill property is almost exclusively effective in PvP settings. The big problem it has is its damage output. It needs to be lower or else enemies will die before the 20-shot trigger for Plague of the Outcasts, but even with the 200% weapon damage in the toxic cloud it’s still around a third of the damage of some standard LMGs. Still, getting it is as simple as playing the game as intended, and it’s brought the Dark Zone back to life, so it’s not all bad!